For a full list of our donors, please click here. Please read the story below about one of our longtime donors. For Tom Murphy, and his family foundation, the Thomas W. Murphy, Jr. Fund of the New York Community Trust, giving to Fieldstone Farm fits in with their family’s passion for horses. Tom’s grandfather was one of the most decorated harness horse racing jockeys and trainers in the history of the sport. 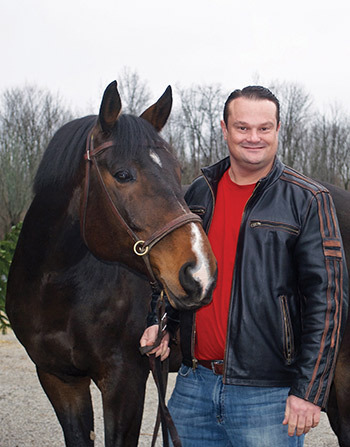 Tom, too, loves horses and became one of the top riders in the region and competed in college. He knows the power of having a partnership with a horse firsthand. And he loves hearing the stories of how our students are progressing at the Farm. It is because of this belief that Tom and his family foundation were major contributors to our recent endowment campaign. In addition, they also funded a state-of-the-art heating and cooling system to help regulate the temperature in our indoor riding arenas. Tom knows just how cold it gets in Cleveland in the winter months, and how hot it can be in the summer. Sometimes we do not ride in the extreme temperatures for the safety and health of our horses, students and volunteers. But with the new heaters and the large industrial fans, we are able to keep the temperature comfortable for everyone. We are grateful to all who have named Fieldstone Farm in their wills, bequests, insurance policies, IRAs or other forms of planned giving. Below is a list of these generous donors.